HIKE WITH THOSE WHO BUILT THE TRAILS! Hike with those who built and manage the trails! The PATC hike program is run by the same organization that built and maintains many of the hiking trails in this area. PATC hikes are conducted by trained hike leaders. The hikes offer various levels of difficulty and distance. PATC hikes are an opportunity to understand the club and its important trail maintenance work. You need not be a PATC member to hike with us, but we hope you will consider joining after getting to know us. Come join us on the trails! - Sign up for a hike - check back soon for our PATC Hikes Meetup Group! The first stated purpose of PATC is "to support and encourage the ... proper recreational use of the Appalachian National Scenic Trail and other trails". This is done partly through the sponsorship of hikes on trails in PATC's area and on other trails. The club has a wide-ranging hiking program which includes local area hikes and excursions into other geographical areas. Hikes can range from short, close-in day hikes to extended excursions. Hikes can be for physical conditioning, social interaction, nature walks, history lessons, to reach a viewpoint, or any of a number of purposes. The club encourages a wide variety of hikes, and provides training and support to hike leaders. See our calendar for full descriptions and more hikes. Also visit our Charlottesville Chapter and Southern Shenandoah Chapter for regional chapter hikes. Vigorous Hikers Tuesday hikes for any age in good physical condition; average 16 miles and 3000+ feet climb. Easy Hikers Wednesday hikes of 3-5 miles in length. Contact us at patceasyhikers@gmail.com to get added to our Easy Hikers email list. Wednesday hikes provided by PATC members, often with multiple options for each hike; e.g. 7 miles or 14 miles. Charlottesville Chapter The Charlottesville Chapter hosts Saturday hikes in Shenandoah National Park, George Washington National Forest, the Blue Ridge Parkway, or in other regional areas. Southern Shenandoah Chapter The SSV Chapter hikes several weekends each month. We also have a short hike one Wednesday each month. Most of our hikes are in the George Washington National Forest or Shenandoah National Park. Other PATC Hikes Natural History hikes, Civil War Hikes, and other hikes of general interest may be run at any time. Look for such hikes on our Calendar. Sierra Club Potomac A special activities section of the Sierra Club Virginia Chapter that organizes hikes and other events for the general public on behalf of the Sierra Club's Washington, DC chapter. Wanderbirds Founded in 1934, the Wanderbirds Hiking Club is a non-profit, all-volunteer club that organizes at least 2 day-hikes every Sunday, year-round, for energetic folks in the Washington, DC area. Membership not required to hike. Capital Hiking Club Local hiking club with options for all skill levels, 52 weeks a year including destination hiking. Public welcome. KTA Hiking Federation Keystone Trails Association is a federation or group of different Pennsylvania hiking clubs & individuals who advocate to protect the trails of Pennsylvania. 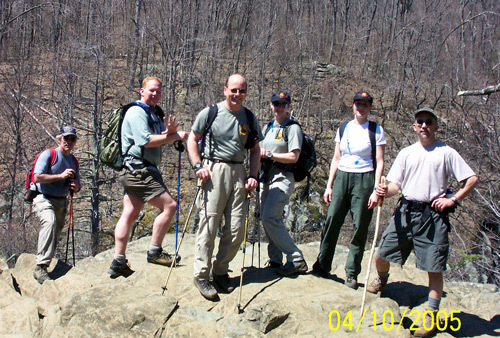 Mountain Club of Maryland The oldest hiking club in Maryland, a Baltimore-based group offering hiking options mid-week & weekends of differing distance & difficulty. Also maintain portions of the Appalachian Trail & other regional trails. Thank you, and lets go on a hike!